Here’s a product I’ve used for more years than I care to count. Perfect for puppy teething issues, Nylabone is a chew toy that I’ve used to keep all my dogs need to chew directed away from household furniture legs both prized, like a family heirloom, and the not so much prized as utilitarian. Nylabone has kept my dogs out of the vet’s office and me free from worry over splinters embedded in gums, and those causing possible damage to the intestines. It is also a great replacement for rawhide which can be a deadly choice. These products are made from inert soft thermoplastic polymer – not plastic that contains toxics. This polymer is also used in medical applications inside the body, for instance, valves. It is not edible. Research shows no cellular changes in body tissues or organs from using this material and no toxic effects. There are no BPA or phthalates in Nylabones. My dogs have always had fun with the Flexi Chew style Nylabone – they have a transparent look and what makes them so attractive for the dog to chew is not only the flavoring, but the “give” of the polymer. It’s that “give” that keeps dogs chewing, exercising their gums. My English Springer Spaniel enjoyed Nylabones too, and went through them at a quicker pace. I do trim off any nubs of polymer that result from teeth gnawing on the tips. The other reason I prefer the Nylabone that is flexible is I like to make sure my dog is getting enough exercise in bad weather, and I can throw these down the hallway and it won’t nick the floor or any furniture it may hit as it bounces. I buy the pack of three because it’s the best value and with my 14.7# Shih Tzu, one package of three lasts the year. Lab type dogs can go through one a month. 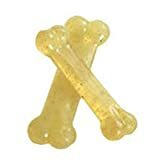 Flexi Chew Chicken Flavor Bone (Souper): Made from inert soft thermoplastic polymer, designed to satisfy the chewing instinct of moderate chewers. Bristles raised during chewing will help clean teeth and prevent tartar build up. Not recommended for strong chewers. Flexi Chew Triple Pack Regular: Made from inert soft thermoplastic polymer, designed to satisfy the chewing instinct of moderate chewers. Bristles raised during chewing will help clean teeth and prevent tartar build up. Not recommended for strong chewers. Flexi Chew Chicken Flavor Bone (Regular): Made from inert soft thermoplastic polymer, designed to satisfy the chewing instinct of moderate chewers. Bristles raised during chewing will help clean teeth and prevent tartar build up. Not recommended for strong chewers. Flexi Chew Chicken/Flexi Chew Original Twin Pack Petite: Made from inert soft thermoplastic polymer, designed to satisfy the chewing instinct of moderate chewers. Bristles raised during chewing will help clean teeth and prevent tartar build up. Not recommended for strong chewers. Flexi Chew Tug Toy Original Flavor: Made from inert soft thermoplastic polymer. Not recommended for strong chewers. Flexible FRISBEE® Flying Disc, flat top (Large): The only official Frisbee® products specifically designed for dogs. Soft, flexible, safe and loads of fun. * Frisbee® is a brand name and registered trademark of WHAM-O, Inc. Used under license. The only official Frisbee® products specifically designed for dogs. Soft, flexible, safe and loads of fun. The Nylabone Flexi Chew Dog Tug Toy is made from inert soft thermoplastic polymer. Not recommended for strong chewers. Clean teeth and prevent tartar build-up. Find more Nylabone Flexi Chew products on Amazon!